WASHINGTON (CNS) — Acts of love, courage and sacrifice by first responders, parents and children alike are hallmarks of a country that is rooted in prayer and deep faith in God, President Donald Trump told the National Prayer Breakfast. The president held up as “American heroes” people from many walks of life who strive to help others as part of their daily routines and in emergencies. He said they are signs of God’s grace during a 14-minute speech Feb. 8 at the Washington Hilton Hotel. In particular, Trump cited American servicemen and servicewomen around the world “defending our great American flag,” police officers “who sacrifice for their communities,” teachers who “work tirelessly” for their students and parents who “work two and three jobs to give their children a better, a much more prosperous and happier life” as signs of inspiration. “American heroes reveal God’s calling,” he said. “All we have to do is open our eyes and look around us and we can see God’s hand in the courage of our fellow citizens. We see the work of God’s love in the power of souls,” he said. Such actions are powered by prayer, he said. Trump also revisited a common theme of earlier speeches: the effort to push out Islamic State militants in Iraq and Syria. He said the militants had tortured Christians, Jews and even fellow Muslims in the territories they occupied, but that they had been almost totally overrun. “Much work will always remain. But we will never rest until that job is completely done,” the president said. Trump concluded by noting the courage and inspiration of a 9-year-old Brownfield, Texas, girl faced with the possibility of not walking again after several strokes. Sophia Maria Campa-Peters, sitting at a front-row table with her mother at the breakfast, learned from doctors that she would not be able to walk because of the strokes, he said. “She replied, ‘If you’re only going to talk about what I can’t do, I don’t want to hear about it. Just let me try to walk,'” Trump told the gathering. As Sophia prepared for surgery Jan. 24 to continue treatment for the disease that caused the strokes, she sought prayers from people. 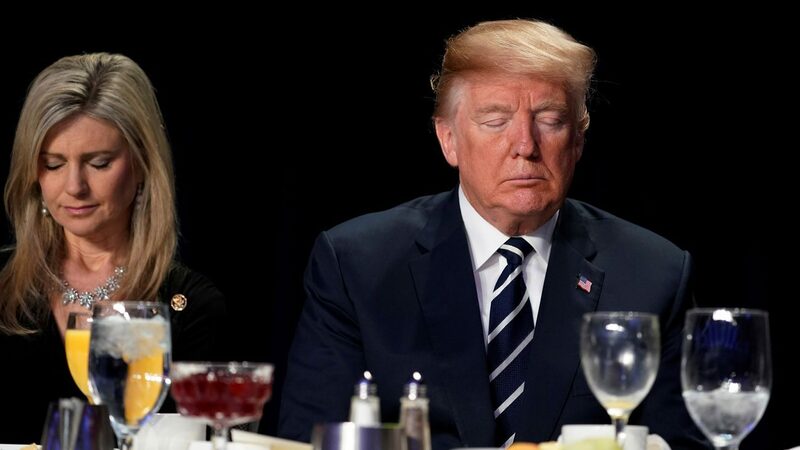 Her goal was 10,000 prayers, Trump continued, but she surpassed the goal, even getting the president and members of his administration to ask God to intervene for her health. “Today we thank God and she’s walking very well,” he said. “You may be only 9 years old, but you are already a hero for all of us in this room and all over the world. Thank you, Sophia,” Trump said. “Through love, courage and sacrifice, we glimpse the grace of almighty God,” the president added. “So through that grace, let us resolve ourselves to ask for an extra measure of strength and devotion and seek a more just and peaceful world where every child can grow up without violence, worship without fear and reach their God-given potential. PREVIOUS: Conference examines challenges facing Catholic higher education in U.S. Anyone who thinks that Donald Trump is some sort of “God-fearing” man is hopelessly naive. You might see him in church on Christmas or Easter (if then), but only for P.R. purposes, and the cameras of course. Religion is not a significant part of his life. Oh, he’ll be happy to surround himself with preachers, and they’ll lay hands on him and pray on him, and he’ll close his eyes and bow his head obediently, but ONLY because it plays well to his base.